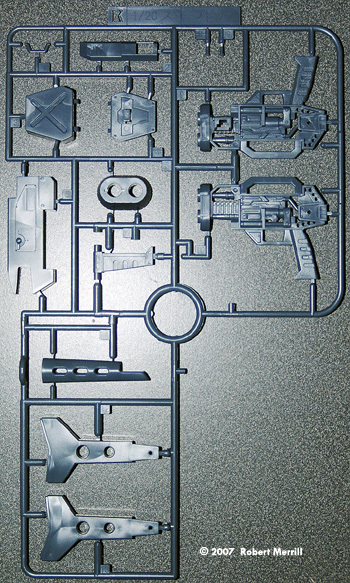 Parts: 281 styrene, 48 ABS, 19 polyethylene, 16 metal, plus lenses and stencils . Detail: 10 more detail that you'd ever see. Detail that gets covered up. So the box shows up. Big, is my first thought. 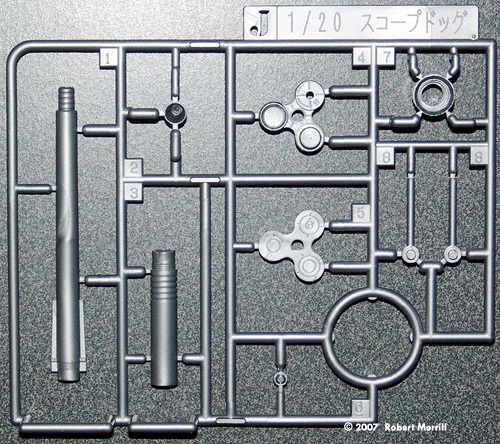 I mean, not 350th Yamato big, more like MG Kamfer big. Twice the size of the 1:24 Wave kits. 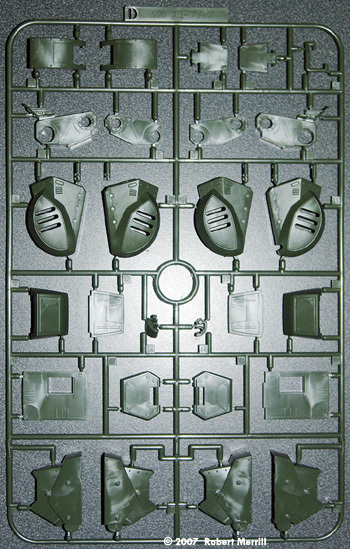 I pop it open and it's packed as tight as an Armored Core box. 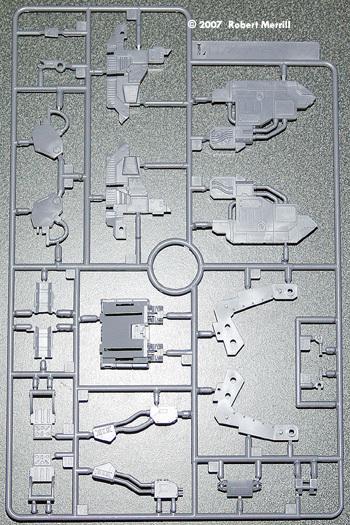 Sprue upon sprue of sweet styrene goodness. Then there are the metal parts. Now I've seen what Adler's Nest can do with micro machining, and even have some of their 1:24 Votoms upgrades, and these are just as good. So lets go through the box. 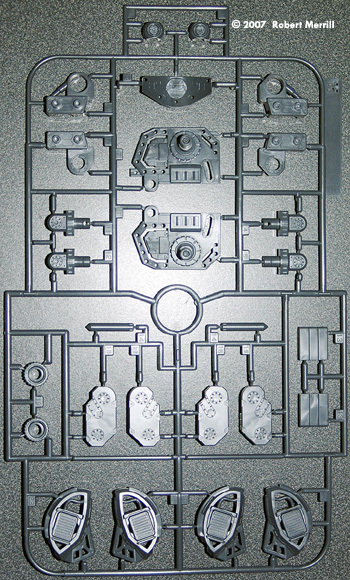 Sprues: As I said there are a number of them: 17 to be exact. 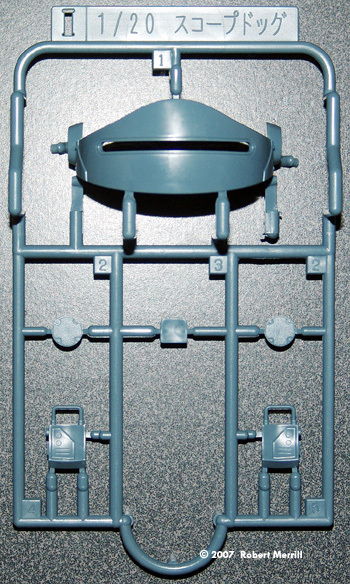 Only one is Bandai's multi-color type, combining green, blue, tan, and clear into one sprue. Everything is flash free, with few parting lines. 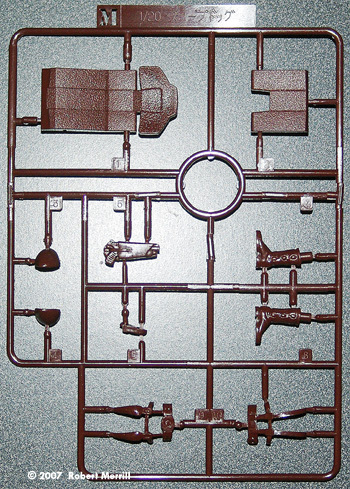 The plastic barrel, sleeve, and scope tube are all one piece castings. No misaligned barrel halves here. Not that I'll be using the plastic barrel, having that metal one to play with. Poly-caps are the usual. 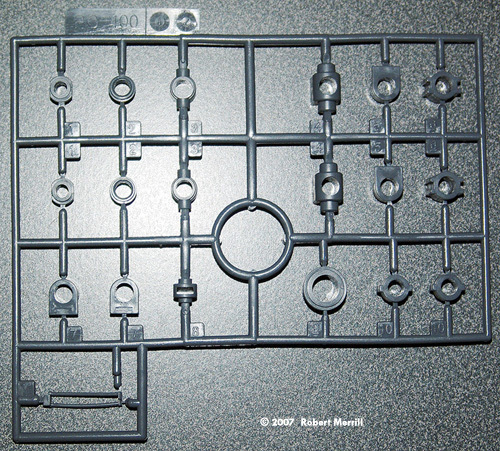 The Brown sprue (Sprue M) looks to be a bit softer that the rest. More flex to it, possibly because it's got some body parts. Speaking of body parts, the pilot on this thing has more parts than some models I've built. 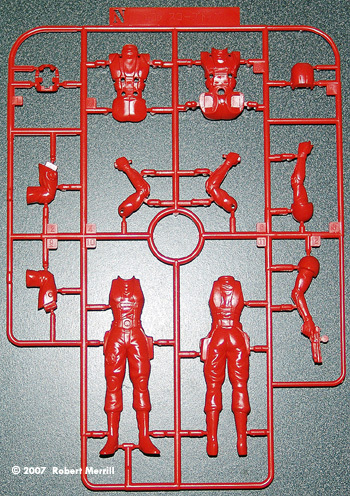 The helmet is 6 parts, the rest of the body is 14 parts. I just wish they'd made the standing figure as nice. One flaw is the helmet has no head inside it so you'll have to paint the clear visor opaque unless you feel up to Frankensteining the standing figure's head. Metal: Ah, now here's the difference. This is what you get for an additional few bucks. The micro-machined barrel and zoom eye are the show cases. Mind you, Alder's Nest 1:24th zoom eye is nicer (it's a 2 parter) but this is better than the plastic one by far. Zero clean up on these. Next is the sheet of PE parts. 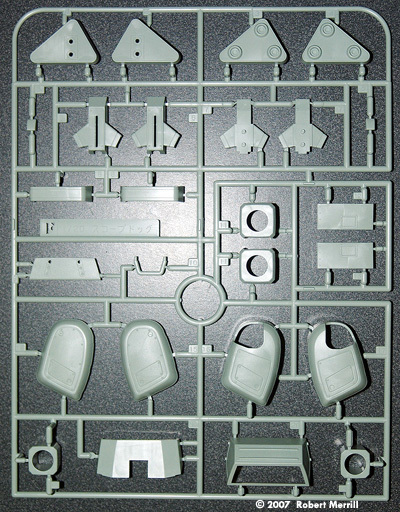 Armor plates and cockpit details abound. 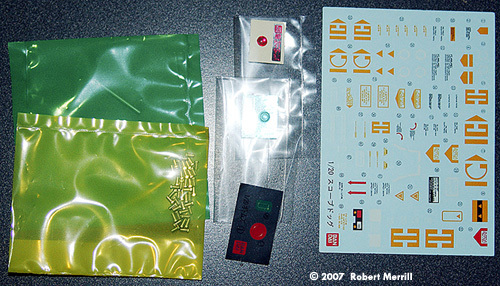 Also included are a set of stencils so if you feel the need to personalize the mech you can. 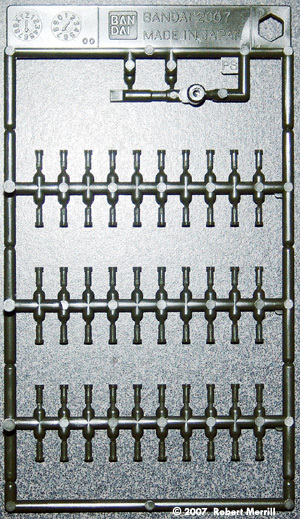 Oh, and you also get 44 metal pop-bolts and a metal hinge pin. Decals are regular water slide transfers. Wow, stunning (for Bandai). Oh wait, there are still some stickers for the metallic look areas. Still, kind of nice to finally have water slides. Also included are two lenses. Nice, shiny, in either red or green. Good, bad, stop, go, I dunno - they just look nice. 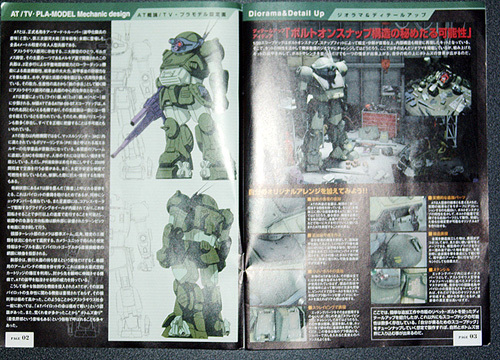 In conclusion, if you're a Votoms fan, buy this. If you're a mech fan, buy this. 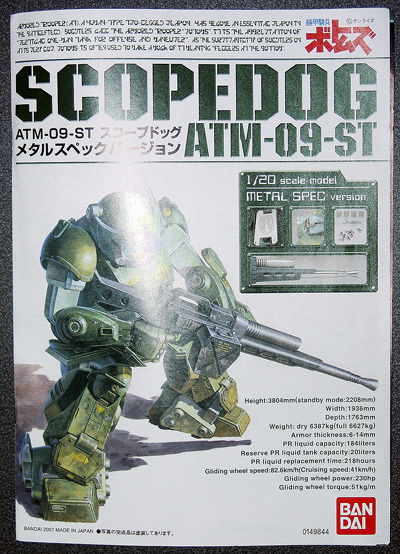 Heck, if you just like well designed and detailed kits, buy this. You'll like it. Really. Is it worth the additional cash for the metal parts? Well.... yeah, in my opinion. Many thanks to Robb's wallet for providing the review samples. Manufacturers and retailers, interested in getting your wares reviewed and publicized on a site averaging 3500+ readers a day? Contact us! Please note that the opinions expressed in this article are those of the reviewer. This page copyright © 2007 Starship Modeler. First posted on 8 August 2007.